Technology of "Kairo" | Ferric Inc.
Technology of the materials for disposable "Kairo"
made possible the exothermic body into the form of sheet and controlling the exothermic temperature. This technology is especially the core for the plaster type of "Kairo." We propose to our clients the different types of this highly functional gas‐permeable film according to the uses such as the "Kairo" for clothes, for directly‐to‐the‐skin type, and for shoes. This chart is made by the data experimented in the lab to show the peculiarities of the exothermic agent by use application. For example, the in‐shoes type is so designe as its temperature does not exceed 60 degrees Celsius, at which level the users’ feet feel comfortable in the shoes where the permeability of the air is limited. The plaster directly‐to‐he‐skin type for medical use is designed with more consideration of safety. 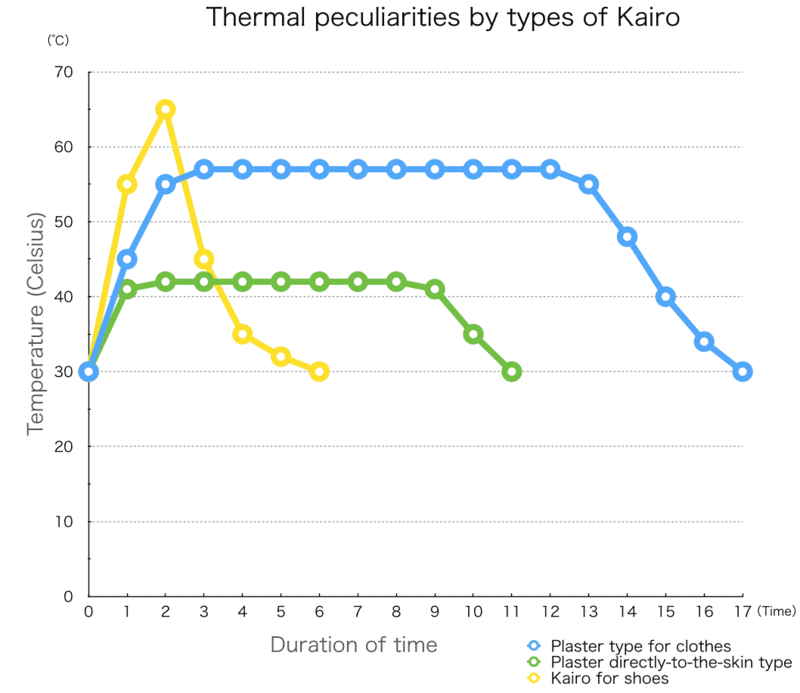 The adhesives used for the plaster type of "Kairo" for the clothes are required to stick to various kinds of clothes such as cotton, silk, wool, nylon, or more newly developed materials. Those used for the plaster directly-to-the-skin type should take into consideration the falling-off by sweat as well as the difference such as of the skin characteristics between the Caucasians and the Japanese which will differ in skin intensity and condition. Needless to say, the materials of high safety must be used as the products are directly applied to the human skin. After all, the elements of "Kairo" are produced with such various "break-through" technologies. The adhesives of acrylic solvent have a good attribute for temperature and are suitable for the elements for the plaster type for the clothes.On the other hand, the hot-melt adhesives are non-solvent and are safer so that more suitable for the plaster directly-to-the-skin type. Therefore Ferric use the hot-melt adhesives for the "Kairo" directly-to-the-skin type, and those of acrylic solvent for the clothes. As such, we propose the wide range of materials according to the use. For example, for the base, we propose to apply the more elastic type in order to enhance the closer contact to the skin. Iron reacts to the Oxygen in the air via water and then the heat is generated. "Kairo" make use of this heating process. In order to make the oxidation more easily, the form of the iron powder are altered to widen its superficial area. Also by adding the activated carbon, the supply of Oxygen is enhanced and the heat generation becomes longer and more stable. Caustic lime (calcium oxide) reacts to the water, turns to the hydrated lime and generates heat. This method is not suitable for "Kairo" but is used for the exothermic containers for such as the lunch boxes sold at the stations or for warming the Japanese wine "sake." Aluminum generates much heat when it reacts to the water by the control of PH. This heating process is applied for the heating bags for canned or retort foods. Ferric is eager in pursuit of the exothermic materials as well. We use the soft and elastic materials for the directly-to-the-skin type for the medical use in order to comfortably fit to the skin, avoiding unnecessary load to the human body. Ferric is developing the products that are to reduce or prevent the risk of low-temperature burn, which is the only side-effect of the local warming, so that the consumers can use them at ease. We are especially putting our efforts to broaden the fields of use, foe example, by inventing the "Kairo" safely usable while sleeping, and those for the purposes of beauty, medical care, health and etc. What the proposals from Ferric will be like? Ferric can make proposals on materials according to the specific use. You want to samples? Preproduction prototypes? Tell us what you need. Ferric will work with you and find the solutions for you. 2F WELL2 Bldg., 3-12-3, Tsukiji, Chuo-ku, Tokyo.